We feel proud to introduce ourselves as the leading manufacturers, traders, and supplier of Lab Model Glove Box. 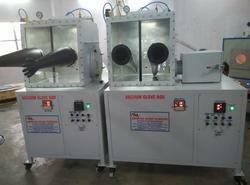 The provided glove boxes are demanded by customers for their high quality & performance. These glove boxes are developed by our professionals using premium quality basic material keeping in mind the set norms. Offered glove boxes are checked in terms of quality in order to dispatch a flawless range. Glove ports: One pair of chemical resistant gloves, complete with O rings on the front panel. The front panel of the glove box will be transported for viewing inside. Nitrogen flushing provision (inlet vales) will be given for flushing with pure nitrogen and digital pressure indicator to be provided for the main chamber. We also deal with Lab Model Glove Box With Ante Chamber. Looking for Laboratory Glove Boxes ?